Taking time to relax and recharge is essential for wellness and productivity. Getting outside, soaking in some sun, and breathing fresh air are all important for mental health. Sometimes a walk around the block helps, but other times you need to get away from the city streets. Just a quick hour and a half drive from Charlotte is pristine Lake Tillery. If you haven’t already packed an overnight bag, here are four more things that make Lake Tillery worth a visit. 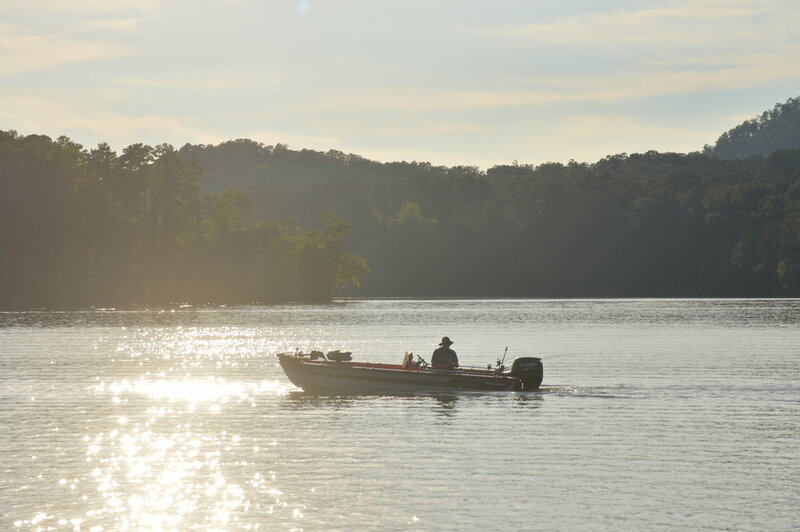 National Parks Surrounded by Uwharrie National Park and Morrow Mountain State Park means that Lake Tillery’s natural beauty is preserved today and always. Whole stretches of shoreline are studded with trees and natural features, with no human development in sight. 2. Boating The best way to get away from it all is on a boat. Kick back, relax, and enjoy your private oasis. You can rent pontoon boats right on Lake Tillery for maximum time spent on the water. 3. Food Just because you’re surrounded by natural beauty doesn’t mean you aren’t close to all the amenities. There is a convenience store and restaurant right on the lake so you can sit on the dock or the huge back patio and fuel up for your adventures. You might even catch some live music. If wine is more your speed look no further than Stoney Mountain Vineyards. Enjoy a glass or two while taking in breathtaking panoramic views of the Uwharrie Mountains and the lower Yadkin Valley. 4. Activities If your idea of a great weekend is more about adventuring than relaxing, don’t worry, Tillery has you covered too. From kayaking, to hiking, mountain biking to off roading, there is no shortage of ways to explore. Some other offerings include, wakeboarding, horseback riding, orienteering, camping, trail running and fishing. 5. Which isnt’ to say there isn’t a lot to do. At one end of Tillery is Lilly’s Bridge Marina. There you can find everything from boat rentals to kayak rentals, a spot to fuel up the boat, or grab some supplies from their convience store. Grab a burger and a drink on the deck of River Wilde restaurant where you might even catch some live music! No matter what you’re looking for in a getaway, Lake Tillery has it. Don’t be surprised if it becomes your new go-to for a quick overnight trip or a week long lake vacation. Check out LakeTillery.com for more trip planning information.